The correct answer is "three." The front (obverse), back (reverse) and… the edge! When you think about it, this makes sense. From this angle – uncommon to most observers – a person can begin to look more deeply at a given subject. From the edge, you are able by definition, to see "both sides" of the story. 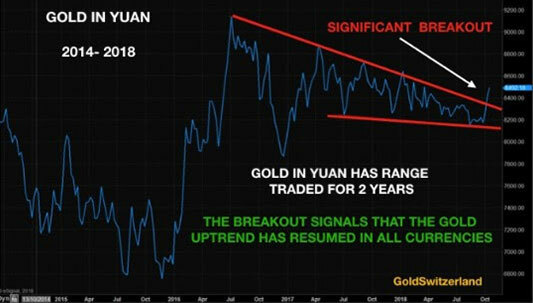 Using Rich Dad's perspective as a research tool helps define and validate the premise of this essay… that the price action right now of gold – and soon silver – are giving us important clues about the direction, strength, and durability of the next price trend. It's easy and understandable for Norteamericanos to become fixated on the price of gold and silver, expressed in their domestic currency, the U.S. dollar. But once in a while, it's important to take a step back and gauge how much people in OTHER countries are paying in their currency when they exchange fiat for some of the honest money that gold and silver have historically represented. When precious metals' buying in these countries continues to increase in spite of the fact that it has become even more expensive to do so, Mr. Market is letting you in on just one more reason why you should pay attention... and either start "stacking" or add to your current insurance/investment position. 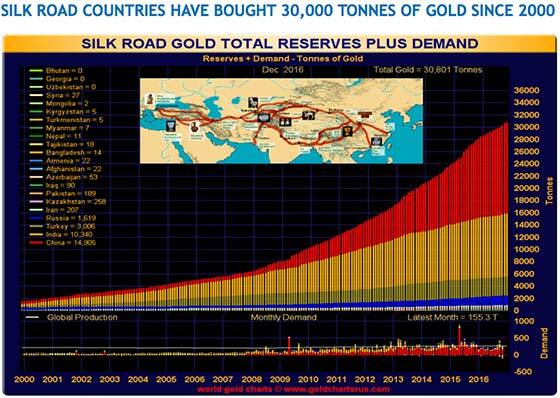 Increased gold purchases by "Silk Road" countries – for going on two decades – have continued unabated in spite of periodic currency devaluations and loss of purchasing power to the U.S. dollar. 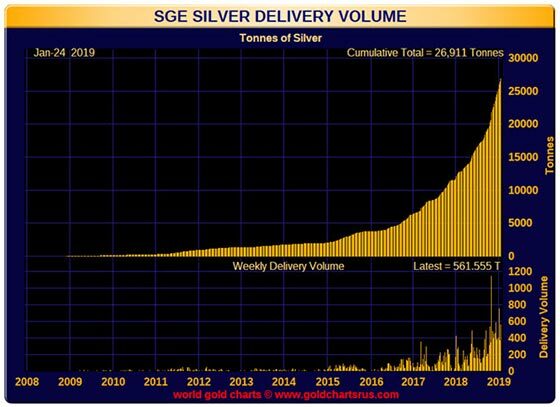 Not to mention that China, which used to export millions of ounces of silver annually, has for some years, not only been keeping all of its internal production, but importing more! Goldcorp was recently bought out by Newmont Mining, creating the world's largest producer. This is the second recent gold company mega-merger – with others almost certainly to follow – indicating the need these operators have for nailing down future ore bodies, as every ounce they produce depletes their reserves. The directional correlation between gold and silver is close to 90%. When you observe the statistical rarity of a gold/silver ratio above 80:1 – which happens to be where we are right now – a "reversion to the mean" is in the offing. One writer has referred to central banks as "one trick ponies with printing presses." But even as they push out more paper promises, these tricksters continue to covet the Midas metal. 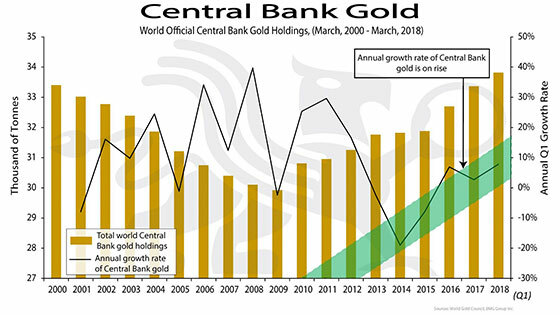 Former Federal Reserve Chairman, Ben Bernanke, pressed to answer why they still held gold, replied curtly, "because of tradition." We'd say there's more to it than his brief reply – a lot more. While no one can predict just how far and how fast prices will rise, the odds of missing out for those who continue to look the other way or who hesitate to act, will parallel the metals' upside trajectory. Then at some point, as surely as the sun rises each morning, many of these same people will decide to step up to the plate and start buying at much higher prices. They will be driven - not by calm, calculated decision-making, but rather by FOMO - the fear of missing out. Do yourself a favor. Behave like "Rich Dad." Get up on "the edge of the coin" and take a look at both sides. Then start "vaulting" gold and silver on a regular basis, while availability is good, and the price is still reasonable.